I've always been interested in stories. I wrote stories as a kid and stapled them together for my mom and dad. The story problems in math always intrigued me..."You have two cups of milk. To make a a dozen cookies you need a half a cup of milk. How many total cookies could you make with the two cups of milk?" I did not care about the answer or really anything to do with numbers. I wanted to know what kind of cookies? Who was making them? And why? Was it a birthday treat or a special after school snack? I would get so lost trying to figure out the whole story, I hardly ever got the number correct. I love stories. I get lost in stories. Sometimes I get found too. 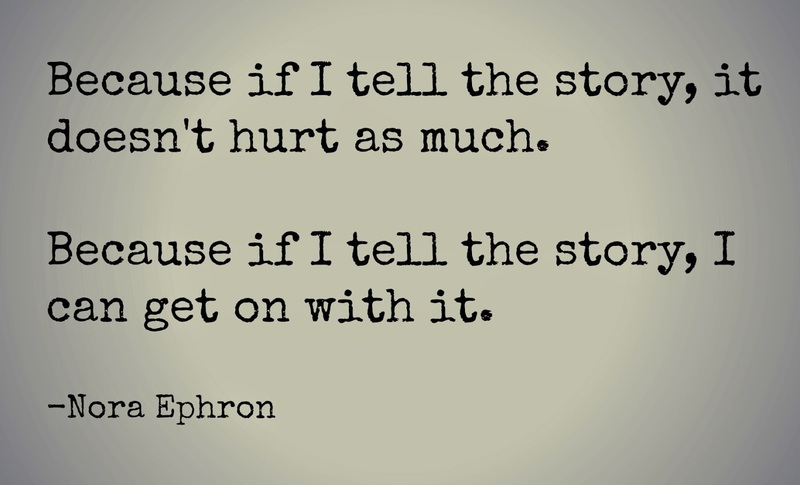 My love of storytelling was one of the reasons I started my blog. It is also a reason I wanted to get involved with Listen To Your Mother. The more I write, the more I learn, the more I listen--my passion for and devotion to storytelling is not only growing, it's exploding. The more open and honest I am with telling stories, the more open I am to hearing them. I am paying attention more to all the stories around me. And they are everywhere. The past few months I've kept a story to myself. The story of my second miscarriage. There are a bunch of reasons I chose not to write about it or tell anyone (our kids don't know). Mostly because I didn't know what to write or feel. Partly because I needed to keep moving and hopefully move on, from both miscarriages. It's been a few months and I feel different. I feel stronger. I feel at peace. I feel ready to get on with it. Part of getting on with it for me is telling the story. So, here it is, the story about how stories helped me during my second miscarriage. 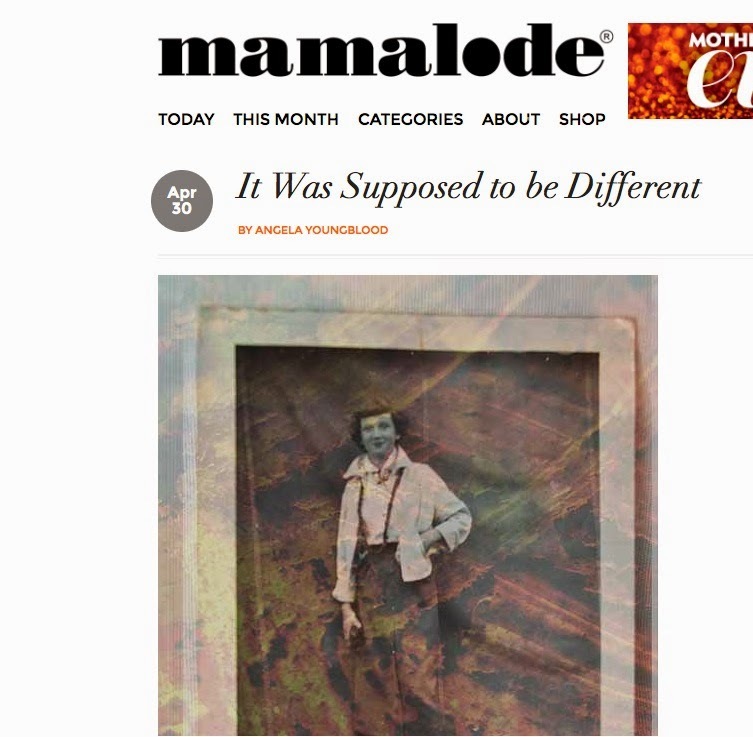 It was featured on mamalode.com. Click here to read the story. I totally get what you are saying about stories. It is so true, getting lost, getting found, pondering the finer points left out a math story problem. Angela, you do have quite a way with stories! This one left me in tears. I am so sorry for both of your losses. I pray that through writing your feelings out that you can find some peace. As a mama that has also been down this road twice, my heart just aches for you. I hope that your sweet kiddos help you to heal and that you are dancing with them again soon! I'm so proud of you to be posted at Mamalode. Good for you!! Thank you Krisitn! Thank you for reading and supporting and encouraging! It means so much coming from you, I love and respect your writing and storytelling so very much. Andrea! Thank you so much for being such a good friend and so supportive. I'm so glad that you decided to tell your story, Angela. And you told it beautifully. Hi Angela - just wanted to let you know how much I love your stories! Always entertaining and your family is so wonderful! Sorry for your losses this past year... hoping your stories help to heal you as well as your family and friends that live near you! Hugs from Cincy, Ohio!